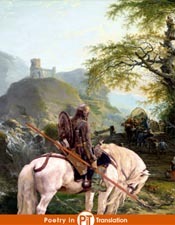 Kline, A.S., (Poetry) "Chrétien de Troyes: Lancelot"
Lancelot, the Knight of the Cart: an Arthurian romance by Chrétien de Troyes written c. 1180 simultaneously with Yvain, the Knight of the Lion. Help keep this site free for all! These downloads are from a published work: ISBN-13: 978-1794662643. Like what you see? Then why not donate a dollar? Alternatively, contribute whatever you see fit.